A SMALL, AFFLUENT NEIGHBORHOOD THAT STANDS OUT WITH ITS INTERESTING INFRASTRUCTURE, MIDCENTURY DESIGNER HOMES. Bonnie Brae is a small, affluent neighborhood between Glendale, Cherry Creek, and Wash Park neighborhoods that stands out with its interesting infrastructure, midcentury designer homes, and an easily recognizable ice cream shop. ​Established in the 1920s, it has historically been an area with design in mind; and though it changed hands a few times throughout its development, it is a theme that has held fast. The small neighborhood is comprised of striking and unique houses, well-manicured landscapes, interesting food and shops, and convenience to the best south Denver has to offer. Bonnie Brae is most recognized by the small square on University Boulevard which boasts a few stops worth noting. There is the Pink’s clothing boutique, with fashions from L.A.; and the Wish Boutique, perfect for small gifts and treasures. For the beauty-minded, there is the Fingers and Toes nail retreat. Across from this retail is a neighborhood library, which offers a lot to the community. ​While recognizable, the square is small; and the real shopping and entertainment gem of Bonnie Brae is the proximity to Old South Gaylord Street. Here live some of the best boutiques of south Denver, including Barbara + Co.; Trout’s; Two Sole Sisters; W Boutique; The Paper Lady; and Silk Road. There are also many more options for spa treatments, including the Defy Medical Spa; Gail Wise Skin Care; Salon Theory; and Beauty Box. In fact, there is even a spa for your four-legged friend called Wash Bark! South Gaylord also houses several art galleries, as well. Sitting in between University Boulevard, Colorado Boulevard, and I-25, Bonnie Brae has every available convenience. There is an easy route to every grocery store—Whole Foods, Sprouts, Trader Joe’s, Safeway, King Soopers, Natural Grocers—as well as the shopping centers of Cherry Creek and the south suburbs. And the options for dining out are endless because of that easy transportation routes; but so are there fantastic choices to be made right in the area. For example, the owner’s of City O’ City have recently purchased and reimagined the once-dive-bar Campus Lounge, right in the Bonnie Brae Square, into a haven for comfort food-seeking vegans and vegetarians. 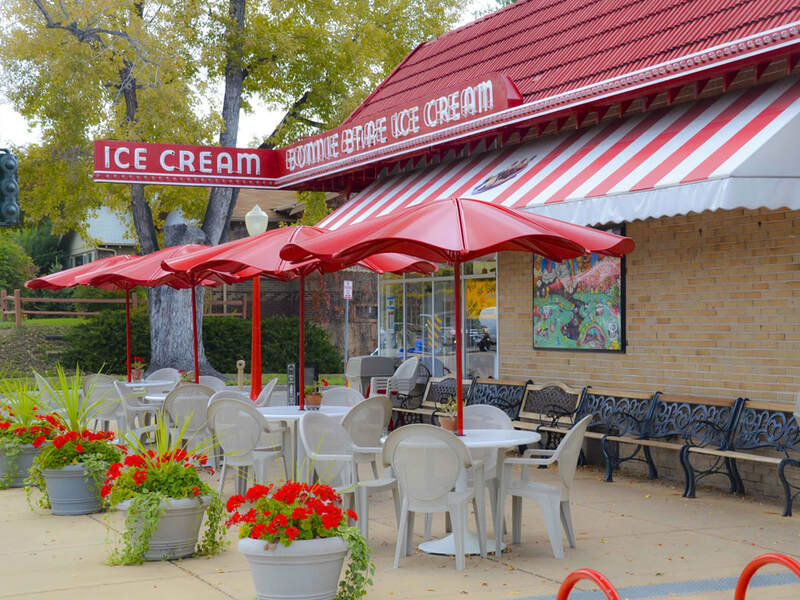 Also in the square are the famous Bonnie Brae Ice Cream shop, where they make the ice cream on-site; and Saucy Noodle, known around Denver for its heavy-on-the-garlic Italian food. Much of the Bonnie Brae dining scene was driven by its Tavern, which was opened right after Prohibition was lifted and contributed to the growth of the area. On South Gaylord Street, try out Devil’s Food for brunch or pastries; Homegrown Tap and Dough for good pizza and salad; or the Charcoal Bistro. A turning point in the development of the Bonnie Brae neighborhood, came at the creation of Ellipse Park. Now known as Bonnie Brae Park, it is a lovely green space with quiet, paved paths that is central to the neighborhood. Bonnie Brae’s size and location also provide easy access to Washington Park and the small green spaces of Glendale, as well as the Cherry Creek Trail. There are a few fitness amenities located with in the confines of the Bonnie Brae neighborhood, like; and the well-maintained sidewalks make the neighborhood itself great for physical activity. There is also quick-access to the Wash Park Rec Center and excellent YMCA facilities.